FREE SIZE.ONE SIZE FITS ALL. Pretty blue lightweight sheer striped Kaftan perfect to throw on. Chiffon colorful tunic-dress, kimono sleeves,Handmade, Designer Size 10. Condition is Used. Perfect condition worn once on holiday. Dress is made off chiffon finish with satin lining. Bust: 89 cm Waist: 73 cm Hips : 96 cm Dress is very short length from the waist is 38 cm. Soft knitted stunning boho kaftan. One size S/M fits UK 10-14. Pretty beading on the front. Made in India.FREE SIZE,LOOSE FIT-ONE SIZE FITS ALL. Stunning print detailed kaftan. The model is a size 12. Long and flowing lightweight silky fabric. Made in India.FREE SIZE.ONE SIZE FITS ALL. 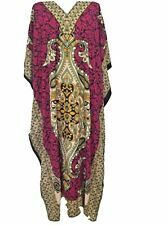 Indian Kimono in Bright Cherry Red Cotton Size XXL Long. Stunning Animal print detailed batwing kaftan with pretty coloured beads around the neckline. IF YOU ARE HAPPY WITH YOUR ORDER. Beautiful urban plus sized clothing has never been easier to find or more affordable! Proudly made in Australia, the relaxed style of the long kaftan dress is designed so one size fits all including AU plus size 30 with the following size specifications. This Kaftan is made from a beautiful, soft multi print Polyester fabric! Kaftan will not fit you tightly; it will be loose and free flowing. This service is not traceable for most of the countries. New kaftan with /tunic one size. available in free size and fits to UK size,16,18,20,22,24.